347 Marlborough is located on the north side of Marlborough, between Gloucester and Hereford, with 345 Marlborough to the east and 349 Marlborough to the west. 347 Marlborough was built ca. 1872 for builder and contractor George Martin Gibson, for speculative sale, one of eleven contiguous houses (337-339-341-343-345-347-349-351-353-355-357 Marlborough). Click here for an index to the deeds for 347 Marlborough. On November 15, 1873, 347 Marlborough was purchased from Hiram Gerrish by Joseph McIntire and Elbridge G. Knight, partners in the firm of Knight & McIntire, wholesale provisions (produce) merchants. 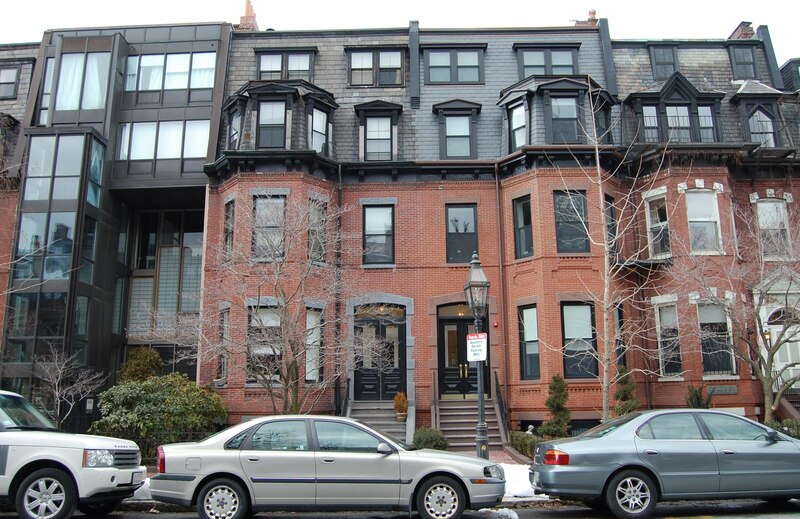 On the same day, Hiram Gerrish also sold them 351 Marlborough, and sold Joseph McIntire 337 Marlborough, 345 Marlborough, 355 Marlborough, and 357 Marlborough. They purchased the houses as rental property or for re-sale. By 1876, 347 Marlborough was the home of hardware merchant Charles Francis Dowse and his wife, Lucy Ada (Howes) Dowse. 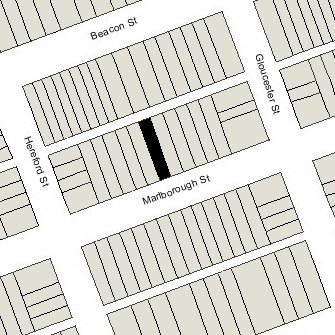 They had married in November of 1875, and 347 Marlborough probably was their first home together. The Dowses were living elsewhere during the 1889-1890 winter season, and 347 Marlborough was the home of Lucy Dowse’s mother, Eliza F. (Merriam) Howes, the widow of Frederic Howes. By 1891, she had moved to 163 West Chester Park (where she died in March of 1891) and 347 Marlborough was the home of Charles and Lucy Dowse once again. On June 1, 1895, Joseph McIntire acquired Elbridge Knight’s interest in 347 Marlborough. Joseph McIntire died in June of 1903, and 347 Marlborough continued to be owned by his estate. The Dowses continued to live at 347 Marlborough during the 1903-1904 winter season, but moved thereafter to 340 Commonwealth. By the 1904-1905 winter season, 347 Marlborough was the home of Dr. Robert Bayley Osgood and his wife, Margaret (Chapin) Osgood. They previously had lived in an apartment at 409 Marlborough. Robert Osgood was an orthopedic surgeon. He was Chief of Orthopedic Staff at Children’s Hospital and an instructor at Harvard Medical School. He maintained his medical office at 372 Marlborough. Dr. Robert Henry Vose, a physician, also lived at 347 Marlborough and maintained his medical office there. In 1904, he had lived at The Marlborough at 416 Marlborough. Dr. and Mrs. Osgood and Dr. Vose continued to live at 347 Marlborough during the 1907-1908 winter season. By the next season, Dr. Vose had moved to 51 Hereford, and by 1910 the Osgoods had moved to 1 Spruce (he continued to maintain his office at 372 Marlborough). 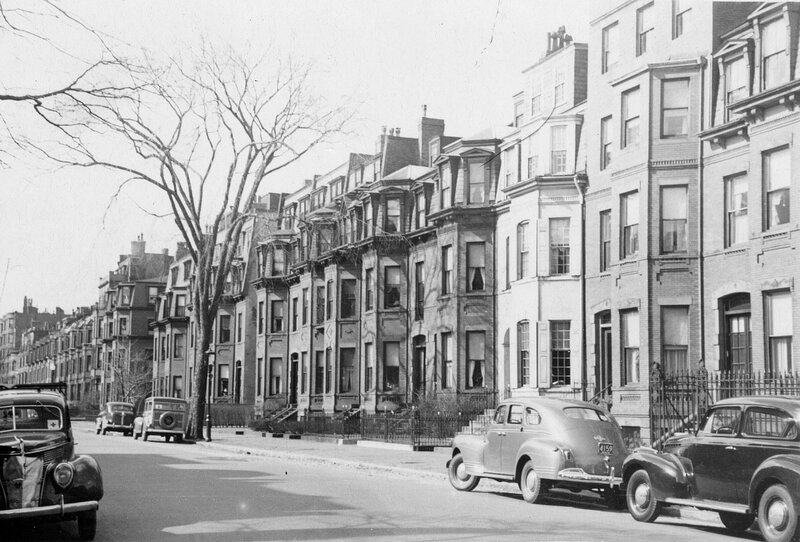 On May 29, 1909, 347 Marlborough was acquired from Joseph McIntire’s heirs by the First Church of Boston (Berkeley at Marlborough). 347 Marlborough became the home of Rev. Charles Edwards Park, minister of the First Church of Boston, and his wife, Mary Eliot (Turner) Park. They previously had lived in an apartment at 405 Marlborough. They also maintained a home in Peterborough, New Hampshire. Charles Park was minister of the First Church of Boston until his retirement in 1946, when he was named Minister Emeritus. The Parks continued to live at 347 Marlborough for the rest of their lives. She died in January of 1960, and he died in September of 1962. 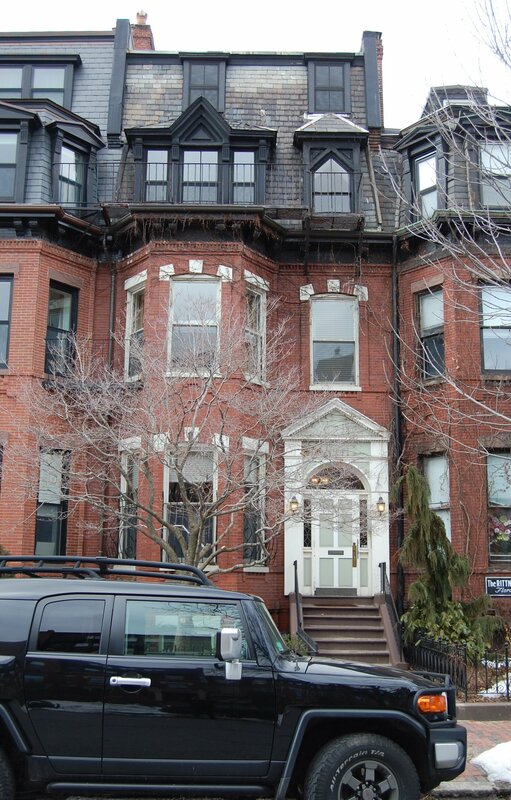 On December 17, 1962, the Unitarian Christian Fellowship acquired 347 Marlborough from the First Church in Boston. By 1964, 347 Marlborough was the office of the Unitarian Christian Fellowship and also the home of its director, Rev. Ronald Michael Mazur, and his wife, Joyce Elizabeth (Mann) Mazur. The house remained the Fellowship’s offices until the mid-1970s. It also was the residence of subsequent directors of the Fellowship. On June 26, 1978, 347 Marlborough was acquired from the Unitarian Christian Fellowship by Charles C. Stuart and his wife, Sarah W. Stuart. In September of 1979, they filed for (and subsequently received) permission to convert the property from a single-family dwelling into three apartments, and also to construct a greenhouse at the rear of the building. 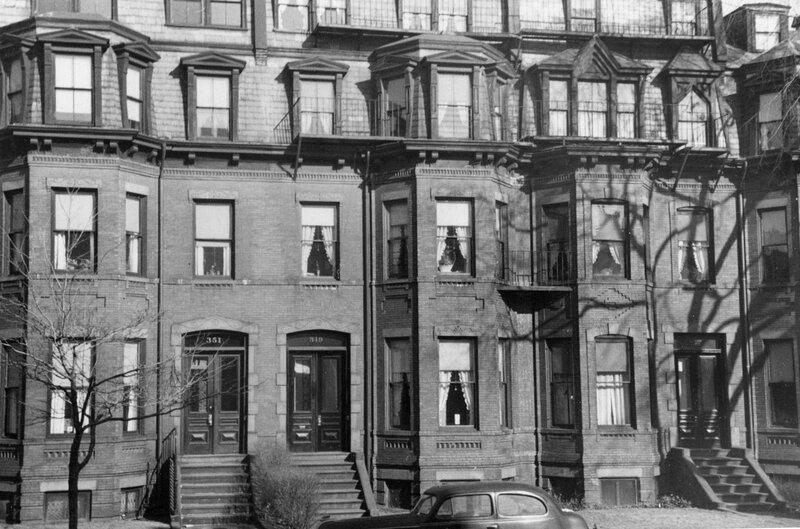 On January 18, 1980, they converted the property into three condominium units, the Charles E. Park Condominium.